Picturesque Tallinn is every influencer’s (or social media user’s, for that matter) dream destination. Whether you are looking for that perfect Instagram or Facebook post, or video content for your Stories or Youtube channel, the fairy-tale-like Old Town, romantic Kadriorg, and bohemian Kalamaja are the ideal settings for beautiful shots. So grab your camera or your phone, come #visittallinn, and follow our guide for the most Instagrammable spots in Tallinn. The Tallinn Old Town is all about colourful medieval houses, towers, cobbled streets, and that special magical allure – no filters needed. Pro-tip: the Tallinn Old Town is a favourite among locals and tourists alike, so if you wish to avoid the crowds during cruise season (summer), plan your visits for early in the morning, or for the afternoon. 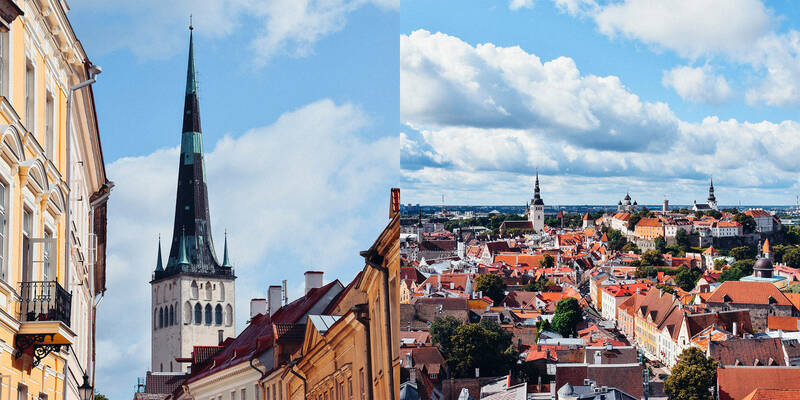 Located on top of Toompea Hill, this is the place to capture the Old Town’s red roofs, winding streets, church towers, and the legendary “The Times We Had” graffiti on the wall, there to remind you of your great moments in Tallinn. Amazing city vistas with the added benefit of being surrounded by a medieval town wall, three defence towers, and a number of mysterious hollow-faced monk statues. Do not get too weirded out though, as otherwise you might miss the serene “breathe baby” graffiti, next to the platform. A charming little passage between Pühavaimu Street and Town Hall Square. Here you will find a couple of picturesque cafés and the cutest (and tiniest) red house in the city, currently home to an adorable design and gift shop. Surrounded by colourful merchant houses and packed with outdoor terraces during summer, Town Hall Square regularly hosts a variety of open-air concerts, fairs, and other events, including Tallinn Christmas Market, voted the best in Europe in 2019. This hidden gem on Vene street is home to charming handicraft shops, and one of the most romantic little cafés in town, the Chocolaterie. 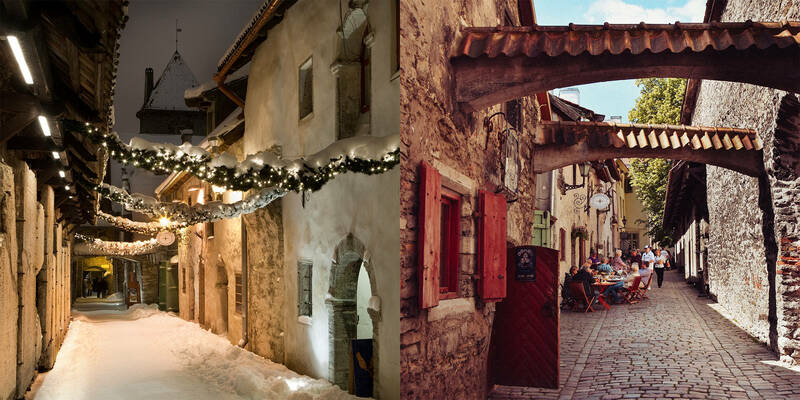 A narrow arched street with a medieval feel. The passage is lined with tiny handicraft shops and studios where you can see the artists in action. What could be better than a good scoop (or three) of delicious, colourful, and totally Instagrammable homemade ice cream? This Renaissance-style building, once the local headquarters of the Black Heads, a guild for young single merchants, is now a regular feature on social media, especially because of its brightly-coloured door. 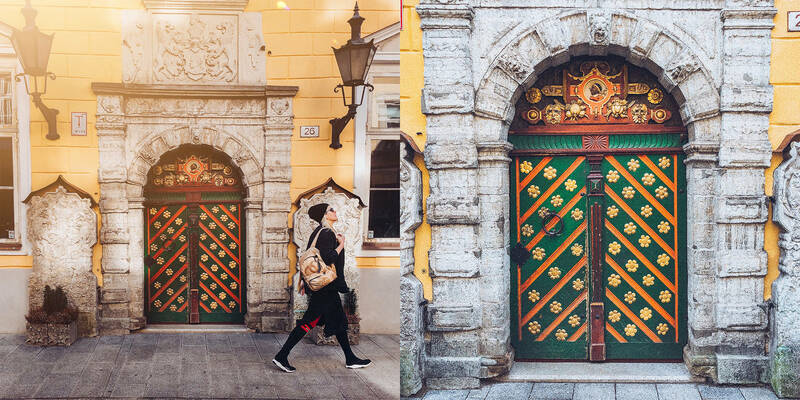 You could even go as far as to say that this is the king of all coloured doors in Tallinn. The 360⁰ view from the St Olav’s 124-metre (407 ft) tower is definitely worth the climb. The church tower is open from April to October. The Towers’ Square is a park on the edge of the Old Town, surrounded from one side by the medieval town wall and, as the name suggests, plenty of defence towers. If you find a good angle, you will be able to get at least four of them in the photo. Behind the central railway station, Balti Jaam, you will find Kalamaja, an intriguing combination of colourful wooden houses and industrial heritage, with a trendy bohemian twist. Time for a snack? So Brooklyn at the Balti Jaam Market’s food court is a master at making bagels, cakes and pastries that are not only delicious but also extremely beautiful. If you are not a huge fan of pastel-coloured delicacies, explore what else the street food court has to offer – we assure you that you will not be disappointed. Telliskivi Creative City is a collection of former factory buildings transformed into bars, restaurants, shops, and event venues. Loved by the locals, it is a perfect place for capturing Tallinn’s buzzing culture and nightlife (and some pretty impressive graffiti masterpieces). Valgevase Street os good starting point to catch a glimpse of the colourful houses (and their bright panel doors) that give Kalamaja its unique allure and, as an added bonus, are very photogenic. If you have more time on your hands, make a little tour around the neighbourhood: Kalju, Kungla, Vana-Kalamaja, and Niine are just a few examples of the charming streets in the area. Like Telliskivi, Rotermann has industrial origins but carries a slightly different feel – more urban and sleek. The area is a combination of restored and brand new, with a very distinct architectural style. Dotted with trendy restaurants, cafés, shops, and offices, this is definitely the place to be to experience the more contemporary side of Tallinn. Named after Tarkovsky’s cult film “Stalker” (1979) that was partly filmed in Rotermanni, this passage is a treasure trove of cool restaurants, bars and cafés. 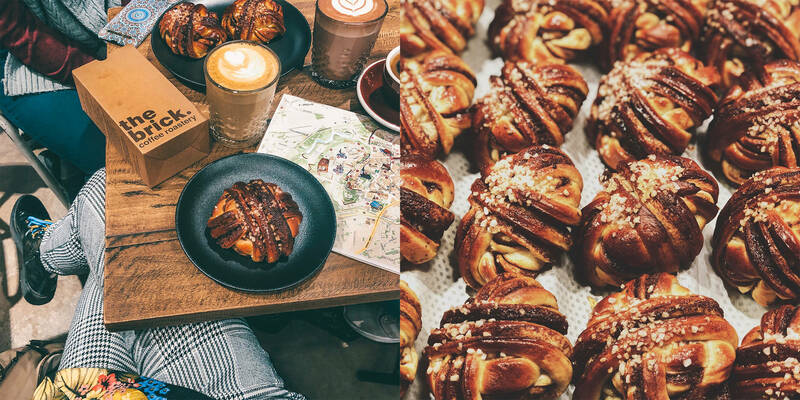 For a coffee break in the Stalker's Passage with pastries that look as good as they taste, head straight to the Røst Bakery. Hidden on the 4th floor of the Solaris Shopping Centre is pastry heaven, full of picture-perfect cakes served against the backdrop of panoramic city views. This baroque jewel built by Peter the Great now houses the Kadriorg Art Museum that displays 16th- to 20th-century paintings from Western and Russian artists. While there, do not miss the decadent two-storey main hall with its elaborately painted ceiling and stuccowork – great for romantic mise-en-scènes. If you have time, take a stroll in the surrounding park – the local treillage, a sort of a vine-covered passage, is a beloved Instagram post spot and is at its most beautiful during autumn. Estonia’s national gallery and centre for contemporary art. The museum’s modern minimalist interiors combined with different displays of art offer inspiration and a great background for photos. The beautiful sculpture gallery full of (whispering) busts is definitely worth the visit. One of the most accessible bogs in Estonia is located in the picturesque Lahemaa National Park, only about a 40-minute’ drive from the city centre. A beautiful wooden boardwalk takes you through the forest and the dreamy landscapes, best captured at sunrise or sunset. Rummu Lake is a submerged limestone quarry in Vasalemma parish, 50 minutes from the city centre. The territory is private property and is not easily accessible due to safety concerns but the views are amazing. When visiting, we strongly recommend contacting one of the tour service providers in advance. For more inspirational photos, videos and tips on Tallinn, follow us on Instagram, Facebook, Youtube, Twitter, and Pinterest. When visiting do not forget to tag your photos with #visittallinn so we can share your amazing content!